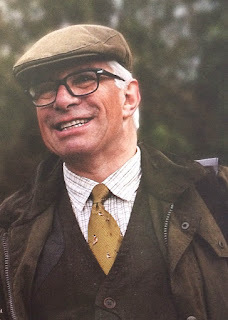 Simon Esnouf is the epitome of the classical English shooter. Read his account of English shooting traditions, and why he uses a shotgun that is almost 140 years old. Did you grow up with shooting? "No, when I was a lad I was obsessed with fishing, and didn't know much about shooting. When I got married, we moved to the country, where my parents-in-law had an indoor shooting range, where we could fire air guns and gallery guns. So it was natural to take up shooting, and my first big passion was pistol shooting." "I started in the air rifle club, which was a bit boring. So I went on to the rifle club, which was really boring. People lay down for ages to take the shot. So I tried the pistol club, and thought: 'Wow! This is for me.' There was lots of shooting, and bullets flying everywhere, quite safely, of course....My first big love was a Colt 45 Canadian revolver from the Second World War. Unfortunately, pistol shooting was made illegal in the UK and disappeared overnight." So how do you shoot today? "We mainly shoot pheasant, duck and partridge. I'm a member of two syndicates. There's a small local farmers syndicate with 16 shooters who take turn to beat and then shoot the next drive. Then we go to the pub, where we can boast that we're actually really much better shots than we are. I also take part in a larger shoot in Suffolk each year. I really enjoy the social aspect of shooting." What is the best shooting advice you have been given? "One of the shooters I've learned a lot from is an elderly gentleman from here in Oxford. He said that when it looked good, it was good. You should never hurry, but take your shot elegantly, like an English gentleman." Do you have a weapon that means a lot to you? "I have a George Gibbs from 1879, which is a really beautiful firearm. It was made in southern England, in the 19th century. It's a hammer gun with a barrel of Damascus steel. It's not very fast, but it can actually shoot birds, if you point it in the right direction. But we also have people who shoot even older guns, muzzle loaders that use black powder. So compared to them, I'm pretty fast." "...but it can actually shoot birds, if you point it in the right direction." What is special about using an old gun? "It sounds different. It's like bells, which all have a different chime. A modern shotgun sounds very hard and tight, while an older weapon has a more melodic boom, which reverberates afterwards. The wood is incredible, and far superior to anything made today." What is your best shooting experience? "One of my best shooting trips was the first time I was out with my colleague John in Northumberland, near Hadrian's Wall - close to the border with Scotland. We'd planned one outing in the evening, and one in the morning. On the first one, I shot my first roe deer from around 120 metres, with one shot. It was an amazing moment. Later that evening we had a good dinner, and a drink, followed by another, and yet another. So we never got out in the morning. Not a very impressive trophy, but I've saved the antlers."